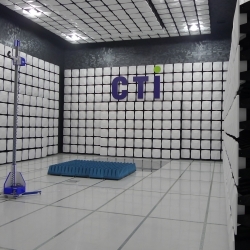 The Gold standard for Anechoic Chamber EMC testing, this 10 meter test range ensures fully compliant Emission and Immunity testing and is compliant to CISPR-16 with a measurement zone diameter of 4 meters or greater. The most versatile and accurate of EMC test chambers. Ferrite tiles and hybrid pyramidal absorbers allow for high accuracy and performance while meeting compact space requirements. Available as a turnkey package – test system, chamber, antenna & mast, turntables, instrumentation and software. EMC compliance testing in accordance with Emissions & immunity standards for all electrical & electronic products.